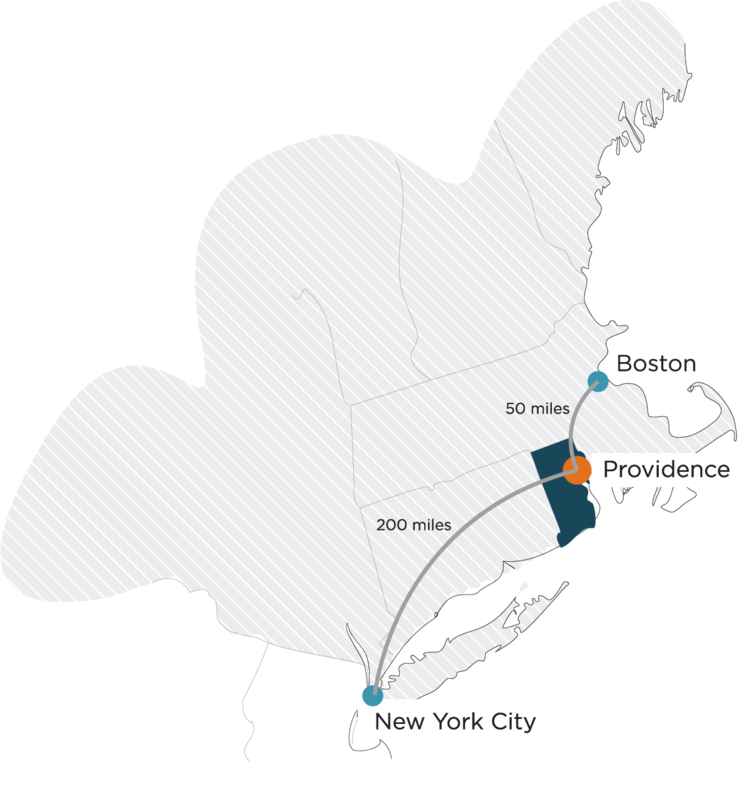 From Providence there is easy access throughout the eastern seaboard, United States, and Internationally by road, air, rail and water. Road – I-95, the main north south transportation corridor, makes easy access to Boston and Northern New England and New York City and the Mid-Atlantic Region. I-195 conveniently connects Providence and the south coast of Massachusetts. Route 146 connects the state to I-90 in western Massachusetts. Air – T.F. Green Airport moves 3.56 million passengers per year, departures 53 jets daily, and offers nonstop service to 14 markets. Commercial freight is also moved through the airport. Passenger Rail – Providence’s Amtrak moved more than 678 thousand passengers in 2013 and Acela Express provides service direct to Boston and New York. MBTA Commuter Rail services T.F. Green to Providence and Boston. Freight Rail – The Providence and Worcester (P&W) Railroad Company covers over 500 miles of rail in Rhode Island, Connecticut, Massachusetts and New York. It transports a range of commodities including processed food and edible food stuffs. Water – The Port of Providence and Port of Davisville are large, modern ports with the capacity to handle bulk and containerized cargo. The ProvPort terminal is one of only two deep water ports in New England.